Please stop by the Center for Wellness and Counseling office for a some four legged furry stress relief and animal assisted education from Paws for Learning! The CWC office is located on the first floor of the Anderson Res Hall. Join us in the chapel today Mindful Monday with Jermaine Nelson; Stress Management for All. Jermaine is a local yoga instructor and health and fitness specialist. What would persuade an active young college student to spend eight hours a day for 10 weeks of her summer in a laboratory looking over carbon uptake data? Ask Jazmine Darden, a sophomore mathematics and physics major from Brooklyn Park. "You learn what a career would be like," she says. "You can't sleep until noon because you have to be at work, and it helps you realize what you want to do." Darden was one of more than 60 students who conducted research this summer through several different programs. Her project, which was conducted with mathematics professor John Zobitz, was funded through the Louis Stokes Alliance for Minority Participation, or LSAMP. The program provides research opportunities through the Northstar STEM Alliance for first-year students of color who are pursuing bachelor's degrees in science, technology, engineering, and mathematics—the STEM disciplines. Darden and five other Northstar STEM researchers worked this summer and also met regularly to discuss their projects and learn about other aspects of the graduate school application process. "What did my friends at the U do?" she says. "Worked at Target. There are so many more opportunities here." She adds that Rebekah Dupont's leadership and support was a very important part of her summer project. Dupont is the LSAMP site coordinator working with the STEM program. "She really took us under her wing and helped us find a bunch of opportunities," Darden says. In addition to helping her explore a career in mathematics, Darden says conducting research allowed her to apply principles she learned from the classroom to the real world. "In Calculus class, you do a bunch of math problems and say, 'When am I ever going to use this?' And we were using it," she says. In August, Darden and three other students attended a national mathematics conference with Zobitz to present their research. 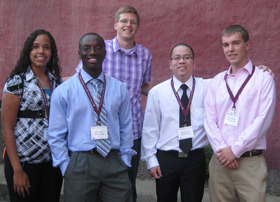 Pictured above [left to right] are Darden, Nana Owusu (LSAMP), John Zobitz, Nghiep Huynh (McNair), and Jeremy Anthony (URGO). "I was proud of our group's presentations because we worked hard to make them eye-catching and interesting," Darden says. "Overall the conference was a great experience and I would recommend it to next year's researchers." When asked about her plans after graduation, Darden confidently answers that she will be going to graduate school for engineering. Not only will she be the first college graduate in her family and the first to earn an advanced degree, she is the first to attend college. "I don't know where, but I just know I am going to go," she says. "I have two older sisters who didn't go to college, so I feel like they are living the college experience through me. And I know my nieces and nephew are looking up to me, too."